An artist's conception shows TW Hydrae (left) and HD 98800A (right), two young star systems that are both members of the TW Hydrae stellar association which formed about 10 million years ago. Chandra observations of their X-ray spectra revealed that, although the stars were both formed in the same region of space at the same time, they produce X-rays by different mechanisms. The insets show portions of the X-ray spectra for each system. Of particular interest are the peaks labeled r, i, and f. These peaks, due to X-rays from neon atoms that have lost all but two of their ten orbital electrons, are sensitive indicators of the density and temperature in the hot, X-ray emitting gas in the star systems. 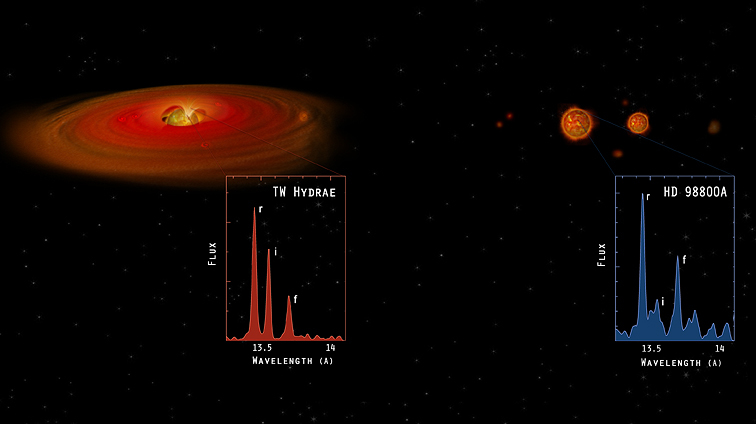 The relative sizes of the peaks in TW Hydrae provide strong evidence that the matter is accreting onto the star from a circumstellar disk as shown in the illustration. X-rays are produced as matter is guided by the star's magnetic field onto one or more hot spots on the surface of the star. In contrast, the spectrum of the binary star system HD 98800A revealed that its brightest star is producing X-rays much as the Sun does, from a hot upper atmosphere or corona. This indicates that any disk around these stars has been greatly diminished or destroyed in ten million years, perhaps by the ongoing formation of planets or by its companion stars. Coordinates (J2000) RA11h 01m 52.00s | Dec -34° 42´ 16.00"
Coordinates (J2000) RA 11h 22m 05.30s | Dec -24° 46´ 39.80"